Splinter goes away and leaves Leonardo in charge. After a while, Donatello, Raphael and Michaelangelo get tired of being bossed around by Leo and decide to try one of Don’s inventions on their hapless leader. The 3 scheming TMNT zap Leonardo with a “Personality Modifying Ray”, turning him into a wise cracking jokester. It doesn’t take long for the new Leonardo to annoy the Turtles once again. Meanwhile on the surface, the City is being destroyed by a criminal musician named G. Cleff. Cleff is using an ultrasonic sound system to shatter concrete and steel so that his goons can rob the buildings. April finds the Turtles and informs them of what is happening. Donatello, Raphael and Michaelangelo go searching for Leonardo to tell him, but discover that he has left the lair to go have fun. When they finally find him, he tells them he is too busy having fun to help them. 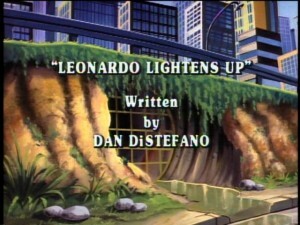 Now the other 3 TMNT have no alternative but to try and stop G. Cleff without Leonardo’s help. G. Cleff gets the best of them and they head back to the lair to think of another plan. Shortly after, Splinter returns and Donatello, Raphael and Michaelangelo fill him in on what has happened. With the Sensei’s help, the Turtles get Leo back to his normal state and the four of them are able to stop G. Cleff from causing any more damage to the City.